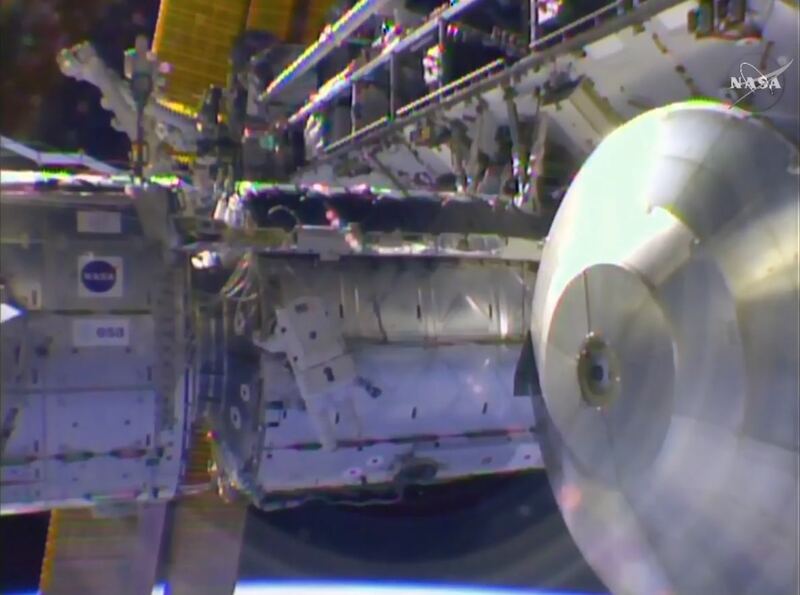 First-time spacewalkers Scott Kelly and Kjell Lindgren ventured outside the hatches of the International Space Station on Wednesday in an excursion lasting seven hours and 16 minutes to complete a series of operations on the exterior of the U.S. Segment of the orbiting outpost. Achieving almost all objectives for EVA-32, the spacewalking duo configured thermal covers on external ISS payloads, performed maintenance on the Station’s robotic arm and laid down cables for future external reconfigurations to set the Station up for the start of commercial crew missions in the future. Wednesday’s EVA was the first for both, rookie space-flier Kjell Lindgren and Scott Kelly, holding the U.S. record for most cumulative time spent in space and currently in the midst of the first one-year mission of a U.S. Astronaut. 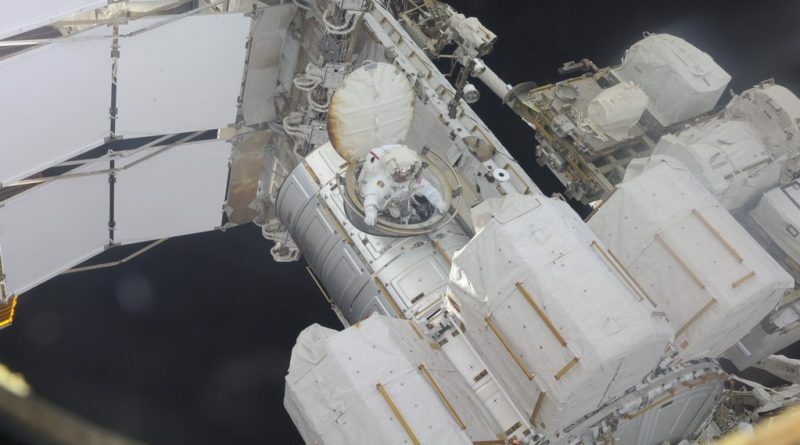 The two spacewalkers spent about three weeks preparing for this EVA, working in the airlock to outfit and resize their Extravehicular Mobility Units and going through a number of procedure reviews, also using virtual reality trainers to get a detailed picture of what they would be tasked with once outside. Most of the tasks for EVA-32 could not be rehearsed by the spacewalkers while on the ground as changes had to be made to the procedures after two of the main tasks expected to be done in the closing months of 2015 had to be deferred in response to the loss of the first International Docking Adapter in the Dragon SpX-7 launch mishap. 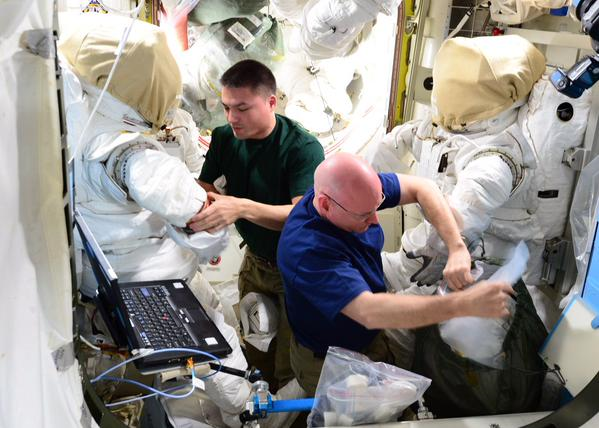 Getting up bright and early on Wednesday, Scott Kelly and Kjell Lindgren donned oxygen masks as part of the In-Suit Light Exercise Protocol that is in place to remove Nitrogen from the blood to avoid the astronauts suffering from decompression sickness. At a reduced pressure in the airlock, the two spacewalkers, assisted by Kimiya Yui and Sergei Volkov, ingressed their Extravehicular Mobility Units and went through a myriad of checks to ensure all suit systems and the communications loops were up and running as expected. They then entered two-hours of in-suit pre-breathe including a 60-minute block of exercise to accelerate the process of removing nitrogen from the blood. When pre-breathe was complete, the two EV crew members had their SAFER jetpacks installed and were moved into the small Crew Lock of Quest. It took some time to get the two crew members into the proper position inside the airlock due to them sharing the confined space with a number of cargo bags and other equipment. They entered depressurization which included the usual leak checks to confirm the suits were holding pressure. In the tight space of the airlock, Kjell Lindgren inadvertently activated his sublimator for a brief moment which is not to be done until in vacuum – giving Mission Control some work to verify the cooling system was operating without issue, also confirmed by the crew in orbit by checking for any ice flakes coming from the suit. When airlock depressurization was complete, Scott Kelly was given a go to open the hatch and the two spacewalkers transitioned their suits to internal power and cooling at 12:03 UTC, marking the official start of U.S. EVA-32. 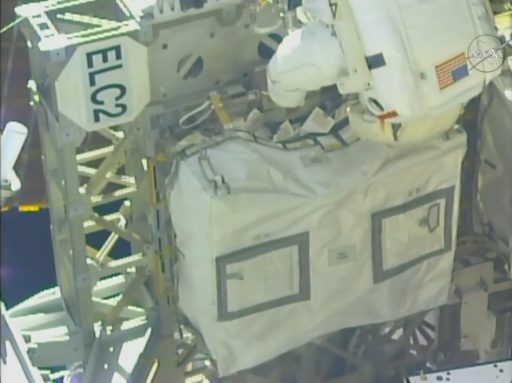 First to climb out of the airlock was Scott Kelly who made quick work putting in place safety tethers for both of the spacewalkers before receiving three equipment bags from Kjell Lindgren. Once all items were outside, Lindgren exited the airlock and went through the usual suit checks with his EVA partner to get set for the planned 6.5-hour excursion. The first task for Scott Kelly was the translation to the starboard truss segment to reach Express Logistics Carrier 2 where a failed Main Bus Switching Unit was waiting to have its thermal cover removed. The thermal cover on the MBSU obstructs the unit’s Micro Square Fixtures which can be used by the Station’s Dextre robot to grapple the system and detach bolts to robotically remove and handle the unit. This particular MBSU failed back in 2012 and was replaced with a spare, but the ISS program desires to repair this MBSU in orbit which will require it to be brought back inside ISS. When plans for the MBSU repair are firmed up at some point in the future, the unit will be transferred to the Japanese Airlock’s Orbital Replacement Unit Transfer Interface. For the repair, the MBSU will be opened up and the crew in orbit will have to replace the failed circuitry within to turn the failed MBSU into a functioning spare for installation as needed. 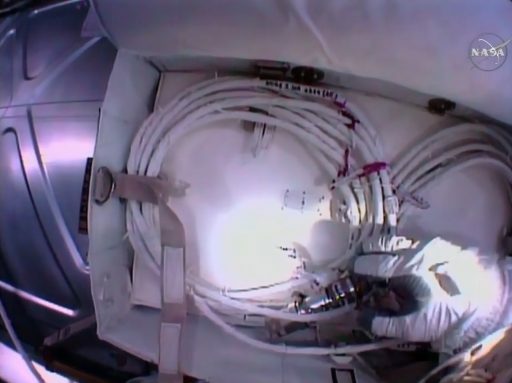 To remove the thermal cover, Kelly began by tying down insulation flaps using wire ties to ensure these flaps will not interfere with a robotic retrieval of the MBSU. He then detached Velcro straps and used a Pistol Grip Tool to fully release a pair of bolts holding the MBSU cover in place. After removing the cover, Kelly put it in a bag and collected photos of the exposed MBSU. 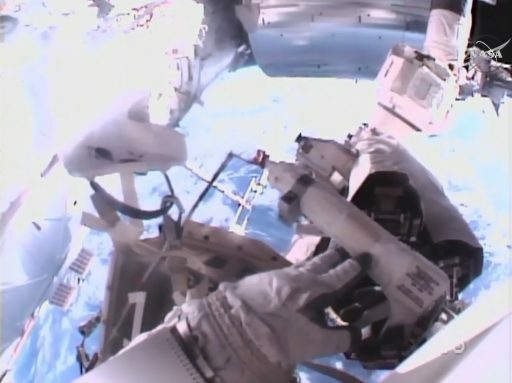 Meanwhile, Kjell Lindgren headed over to External Stowage Platform 2 where he stowed the arm lubrication tools and picked up an Articulating Portable Foot Restraint. He then moved outboard to follow Kelly and get in a good position to start work on the Alpha Magnetic Spectrometer, the Station’s flagship astrophysics instrument collecting information on billions of energetic particles to track signatures of dark matter. Setting up and ingressing the foot restraint at S3 Worksite Interface 1, Lindgren got started by installing a Multilayer Insulation Wedge on the AMS-2 payload and conducting a photo and video survey. Afterwards, he unpacked the neatly folded AMS blanket and began putting in place four hooking straps to firmly hold the thermal blanket in place over the face of the AMS. This task required some time to properly unfold the bag and ensure it was neatly placed over the appropriate section of the large AMS detector. 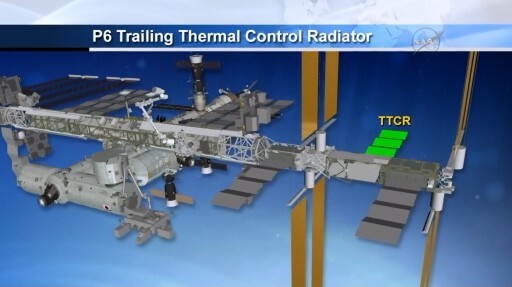 The cover protects the thermal pumps inside the AMS from extreme temperatures which can occur when ISS passes through periods of high beta angles, meaning ISS encounters the sun side-on for extended periods of its orbit which changes the overall thermal situation along the truss. Previously, during high beta periods, AMS was shaded by moving the Station’s radiators to cast a shadow on AMS – a procedure that will no longer be needed with the cover in position. 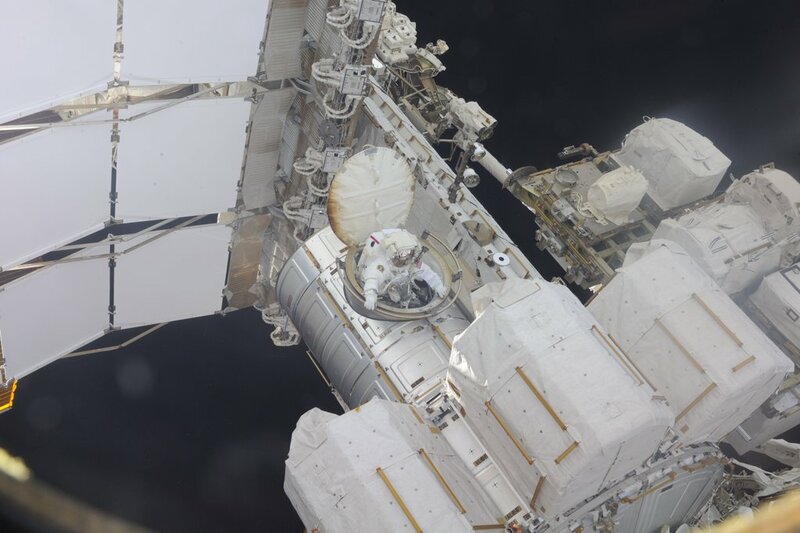 When complete on the truss, Scott Kelly went back inboard, dropping off the MBSU cover bag and translating to External Stowage Platform 2 to begin the multi-hour task of lubricating Latching End Effector B (LEE-B) of the Station’s Canadarm2. The lubrication of the arm’s LEE components has become necessary after 13 years of arm operations and a gradual degradation in recent years seen as increased motor currents in telemetry signals sent by the arm. To prolong the arm’s lifetime since it is a critical element of ISS operations, teams devised a plan to conduct maintenance on the end effectors, a task not originally planned to be performed in space. 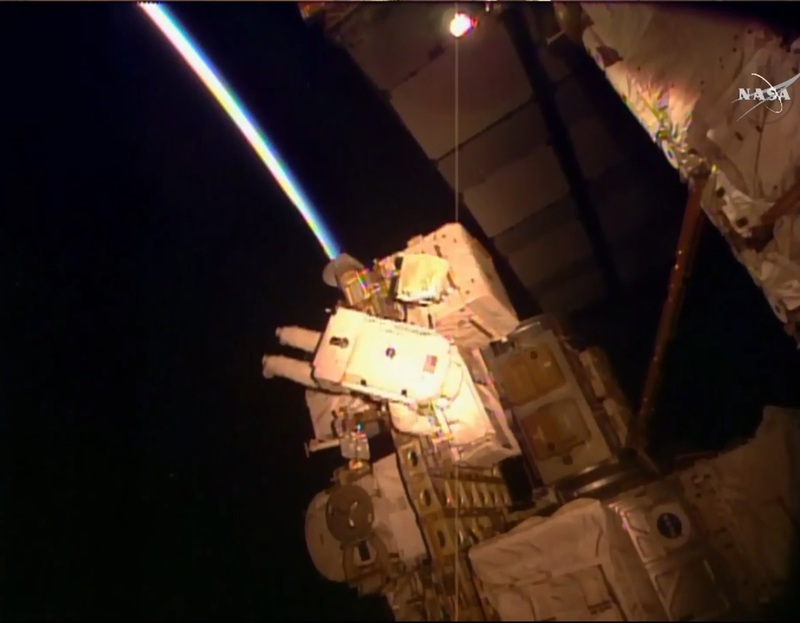 The Lubrication Task on LEE-A was completed by Terry Virts as part of EVA-30 back in February and testing of the system showed that the lubrication did have the expected positive effect on the moving parts of the system. Getting into a foot restraint set up on ESP-2, Scott Kelly was essentially tasked with mirroring what Virts did on the other end effector, a delicate task involving working in the blind. Because the LEE was not designed for in-space servicing, Kelly was facing some work to be done blindly, only going by feel. All in all, he was tasked with lubricating the following components: the center Ballscrew, the Latch Ball Screws, the Linear Bearing Tracks and the rollers & brackets. The main tools available to Kelly were a grease gun containing gray vacuum grease and the BLT, Ballscrew Lubrication Tool – a contraption consisting of a cradle to hold the grease, a rod and a handle to be used to deposit grease onto the ballscrews that lie somewhat inward of the LEE and can not be accessed directly. Once in the foot restraint, Kelly guided Kimiya Yui who was carefully moving the LEE-B closer to Kelly to allow him to access the system. To get a feel for the situation, Kelly started with the Center Ballscrew on which he first did a dry run to see if he could feel the BLT coming into contact with the screw. Next, he transferred some grease onto the BLT and completed the lubrication of the Center Ballscrew which is easily visible, allowing Kelly to move the BLT cradle around and along the screw to deposit grease onto it. Having gotten the feel for the situation, Kelly guided Yui to move the first latch into a good position for access. He conducted another dry run, this time in the blind since the Latch Ballscrews are hidden within the end effector. It took him several attempts to get the placement right and confirm the tool was making contact with the screw. Using the depth finder on the BLT, Kelly found the proper position and repeated several runs with grease to lubricate the screw. In between lubrication on the four latches, the LEE was rotated by Yui and Kelly used the grease gun to replenish the grease in the BLT cradle. It took over one hour for Kelly to complete the lubing of the four latches, causing the EVA to drift well behind the timeline. The latches of the end effector were retracted to reveal the Linear Bearing Tracks on which the latches glide when retracted and deployed. Two tracks are part of each latch and lubrication was to be done to the inside and outside of each latch, giving Kelly plenty of work. Luckily, the tracks are easily visible and can be accessed directly with the grease gun. However, Kelly had to keep up his concentration not to touch or lubricate the microswitches residing in between the bearing tracks. Again, the arm was moved in between greasing of each latch to provide EV-1 with the best possible access. Next up to be lubricated were the Equalization Brackets and Rollers that are in motion when the arm grapples onto a fixture, however, Mission Control decided not to continue with this task and have Kelly clean up the worksite given work had drifted over an hour behind the timeline. 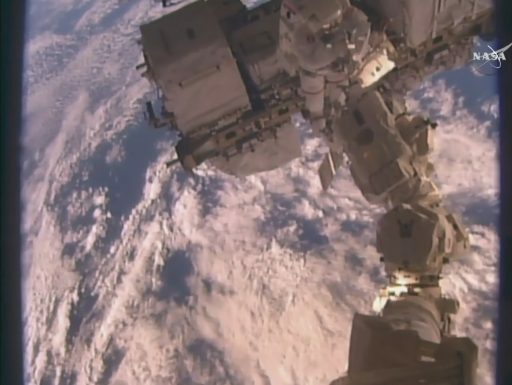 While Scott Kelly had both hands full giving Canadarm2 a re-work, Kjell Lindgren switched equipment bags at the airlock and went over to the Destiny Laboratory where he stowed the IDA Cable Bag to get started with the task of routing a pair of cables – a data cable and a power cable that interface with power/data ports in the forward section of Node 1 and extend to Node 2 zenith to be eventually connected to Pressurized Mating Adapter 3 and International Docking Adapter 3 once these components are installed. The first part of the cable installation was completed in February in two EVAs performed by Barry Wilmore and Terry Virts who routed all cables for the installation of International Docking Adapter 2 on Pressurized Mating Adapter 2 and also began placing cables for PMA-3 that will be relocated late in the year or early in 2016. 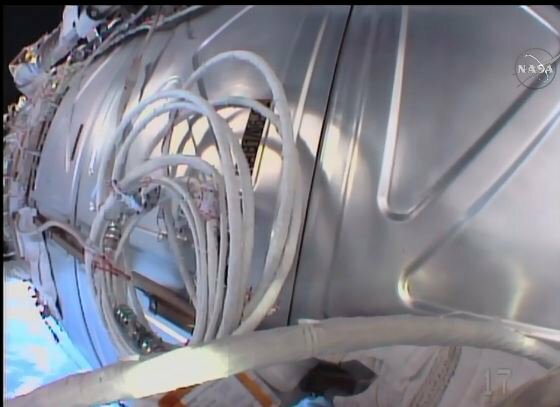 Each cable was coiled up in two segments, one to be routed forward towards Node 2 and the other to be tied down in the aft direction to interface with the Lab/Node1 outlets. First up was the W2260 orange data cable that Lindgren secured to handrails with wire ties, starting with the aft segment to reach the P601/J601 connection to mate the cable with the appropriate interface. He then took out the slack and returned to the center point of the cable to fetch the second bundle that re routed to the Node 2 03-05 position near the zenith Common Berthing Mechanism where PMA-3 will be relocated. Continuing the tedious cable work, Lindgren retrieved the W2289 cable colored purple. He went through the same sequence of steps, routing the first coil to the aft to Node 1 where the power cable was to be plugged in after an old connection was broken. The old connectors gave Lindgren some trouble as he had to use leverage to disconnect the old connectors. He then mated the W602/J602 connection and continued moving the cable forward. Originally, the forward routing was to be done by Scott Kelly, but due to him needing more time with the lubrication, this item was added to Lindgren’s task list. As a result, the installation of a Non-Propulsive Vent on the Node 3 module was dropped from this EVA and will be done on a future walk. 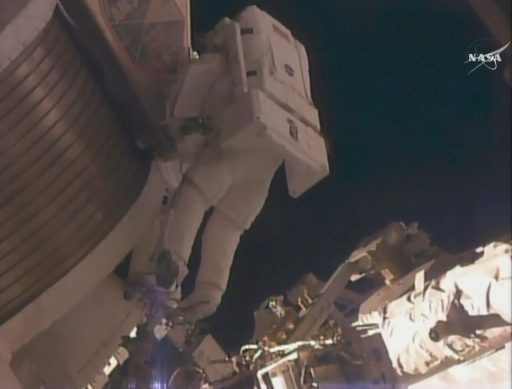 Wrapping up their tasks after a challenging EVA, the two crew members met up at the airlock to go through a detailed inventory of their tools, bags and equipment. Checking their suits and reconfiguring their tethers, the crew got ready for ingress – this time Kjell Lindgren led the way, climbing into the airlock to be handed the various tools and bags that were needed back inside before Scott Kelly detached the final safety tether and moved into the airlock. The spacewalkers connected their suits to ISS power and cooling systems and waited for the sublimator clock to run out ahead of closing the hatch. Scott Kelly closed and locked the hatch and the team began the repressurization of the airlock at 19:19 UTC, putting an end to a 7-hour and 16-minute walk in space. With both crew members being first-time spacewalkers, their total EVA time stands at 7:16. For ISS, this was the 189th spacewalk dedicated to Station Assembly and Maintenance totaling 1,184 hours. Kelly & Lindgren will be able to add to their spacewalk records next week as U.S. EVA-33 is set for Friday, November 6. As part of that EVA, the two crew members will move all the way to the outermost port truss segment where they will spent several hours to return the P6 Photovoltaic Thermal Control System to a nominal configuration.